Boone County investigate opportunities to partner with Red Bike and private companies to develop a public/private operating and capital funding plan that expands the region’s successful bike-sharing services and facilities to suburban Boone County to support workforce development/accessibility and overall recreational health and well-being. Step 1: Boone County, in cooperation with Red Bike and TANK, conduct a planning process that brings businesses to the table to identify interested participants, investors and potential Red Bike station locations. 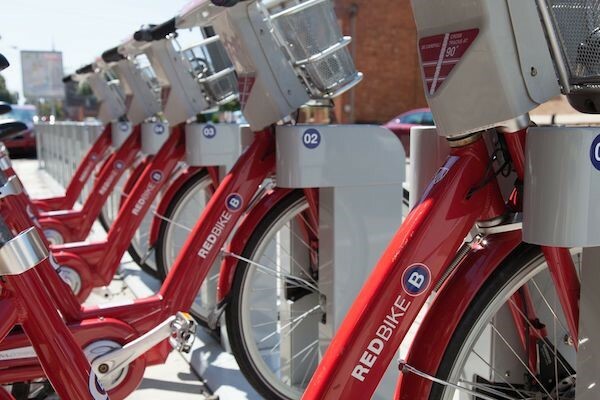 Step 2: With operating and capital funding in place, Red Bike work with Boone County, TANK and private partners to select five pilot station locations. Site selection should consider existing safe bicycle routes and potential connections to high volume TANK bus express and local fixed routes, stops, and the Florence Transit Hub. Step 3: Once stations are completed and proven successful through usage, Red Bike would consider the creation of additional stations to provide a more connected bike-sharing network. Builds upon an existing and proven Red Bike program. This supports Boone County’s goal of improving safety and connectivity for bicycles and pedestrians. Click HERE for a map of multi-use paths in Boone County. Provides an important and cost effective multi-modal option for employees to access Boone County’s growing availability of jobs, thereby maximizing public and private transportation investments. Increases Boone County employers’ ability to attract and retain employees by enhancing mobility options for potential workforce candidates through increased accessibility. Enhances Quality of Life and health benefits to bike-sharing users. Reduces single occupant vehicle (SOV) travel and Boone County roadway congestion through increased bicycle, and potentially transit, usage. Securing needed operational and capital funding through public/private partnerships for a new, suburban bike-sharing concept. Variable weather conditions may impact bike-sharing usage. Working with private employers to market and incentivize use of Red Bike to their employees to secure critical mass. Determining Red Bike station locations to meet bike-sharing customer origin/destination needs. Establishing prices and fare collection that for accessibility by customers of all economic means. Existing and future data identifies areas throughout Boone County experiencing congestion-related concerns and travel time delay due to high use of Single Occupant Vehicle (SOV) travel. Boone County already holds the title as the fastest growing county in the OKI region and Commonwealth of Kentucky. Boone County population growth is projected to increase to almost a quarter of a million people by 2040. Boone County also leads the region and state in employment growth with an additional 20,000 or more new employees by 2040. The Hebron, CVG and Florence area is the location most impacted by this growth in employment. These areas are home to major companies that serve as significant traffic generators employing hundreds of people who reside across the entire OKI region. Workforce availability and accessibility has been acknowledged at the local, county, regional and state level as a critical issue facing continued economic growth and vitality. Many roadways in the Hebron, CVG and Florence areas have been improved with sidewalks and/or multi-use paths. Boone County is dedicated to expanding bicycle and pedestrian facilities. In particular, building off of the Aero Parkway multi-use trail, projects are underway for connections along KY 18 and KY 237 as part of the CVG Loop Trail. This Boone County Transportation Plan includes numerous roadway and stand-alone bike/pedestrian improvement recommendations. TANK currently operates nine express routes, one local fixed route, seven Park & Ride lots, and one Transit Hub in Boone County. One of the most frequently received public comments during the development of this Boone County Transportation Plan was the need for safe and connected pedestrian and bicycle facilities.